STOCKTON - Eric Schmidt had put in a new engine and at the end of the day his bumper was barely attached to his car. But he still managed to win the Spring Classic. The driver from Roseville overcame car problems and handled 100 laps of bumps and spins around him to win the featured Western Late Model race on Sunday at Stockton 99 Speedway. The season opener featured competition in Western Late Model, Grand American Modified, Street Stock and Bomber divisions. 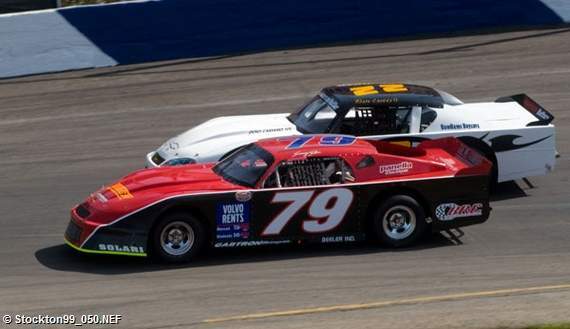 Sam Solari (79) passes Ben Lewis II in a battle for first place in the Street Stock Division during the Spring Classic Sunday at Stockton. Schmidt, 35, was the WLM fast qualifier on Saturday, but had a problem with a valve in practice on Sunday and switched engines. He took the lead 13 laps into the event and he led the rest of the way while being hit from behind several times. "It was fine on Saturday and the first practice (on Sunday), but we popped a valve and had to swap motors," Schmidt said. "And when I got out front, I just started to try to go start on the restarts to try to keep those guys off my tail." There was a lot of action behind him, especially on the restarts. Mike Self of Salt Lake City, Utah, finished second, but he had a good amount of body damage. "Turn one is just rough, everyone wants to go in and get as far to the inside as they can," Self said. "Unfortunately, there's only so far you can go." Mark Holman of Los Altos was third, Trevor Schlundt of Clovis was fourth and defending Stockton 99 champion Justin Philpott was fifth. "We struggled the entire race, it was a long 100 laps," Philpott said. Scott Winter of Tracy was the Grand American Modified champion at Stockton 99 last season and with a strong victory. He moved into first place on lap 15 and controlled the rest of the race. "The car rolled off the trailer in really good shape, we tuned it a bit and I knew if we stayed out of trouble we had a car to win this thing," Winter said. Sam Solari of Escalon used a shrewd veteran move to pass Ben Lewis II of Stockton in the 50-lap Street Stock race. Lewis had the lead on lap 16 when he approached the car of Dave Deni, who was about to go down a lap. Solari was able to pin Lewis behind Deni. "The lapped car was working outside, and that's why I ran the bottom of the track," said Solari, 37. "We want to be a threat this year and that's what we want, to be able to race side by side." race Sunday at Stockton Speedway. Tom Dahl of Stockton won the Bomber race in a 1969 Chevrolet Impala yellow taxi. He took the lead on lap 3 of the 50-lap event, and held off Lewis in a final duel after a yellow flag with four laps remaining. "That's the last thing a leader ever wants," Dahl said. "And I always worry whenever there's a restart." 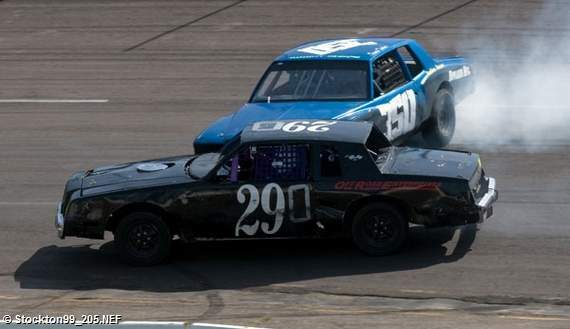 Lewis finished second in the Street Stock and Bombers, but will compete exclusively in the Street Stock class when the NASCAR regular season begins on March 27.